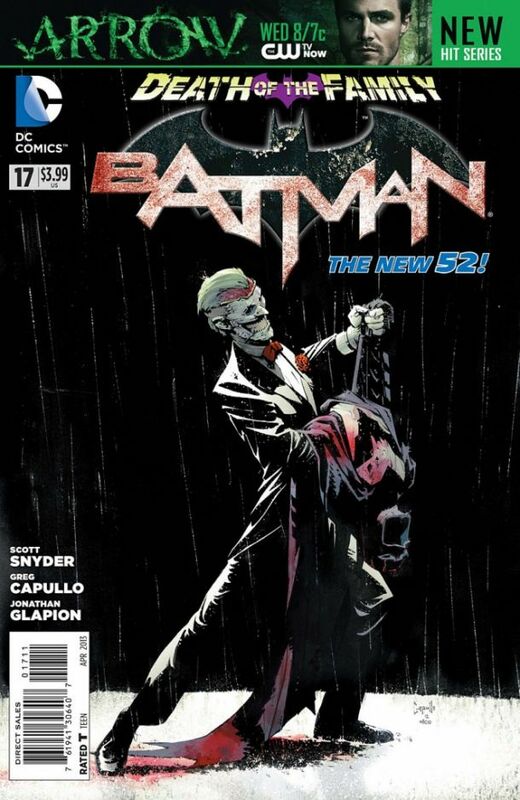 Batman #40 *(SPOILER ALERT! )*-- It Happened! Batman #40 *(SPOILER ALERT! )*– It Happened! Today marked the release of Batman issue 40, the conclusion of the End Game story arch. Be warned, this article will be filled with nothing but spoilers! Below is a back story to the events that transpired today, if you are already familiar with the current Batman story, skip ahead down below. 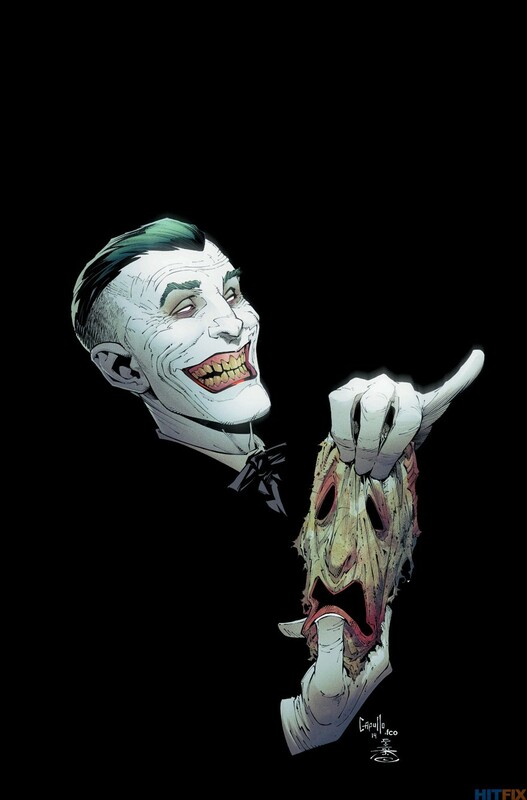 The End Game story arch is The Joker’s return to Gotham following the events of Death of the Family, Batman Inc’s conclusion, Forever Evil, and Zero Year. Death of the Family had The Joker terrorize Gotham for the first time in the New 52, leaving the entire Bat-family estranged to one another. The aftermath of the event had The Joker escape, only leaving behind his- then cut off face- mask; Batgirl isolating herself from Batman and moving to a different part of Gotham; Batwoman stayed away, as usual; Nightwing isolated himself from Batman and moved to Chicago; Red Robin permanently moved to with the Teen Titans; Red Hood actually got a little closer to Batman; Catwoman kept a little farther distance than usual; and Robin (Damian Wayne) started having daddy issues again. 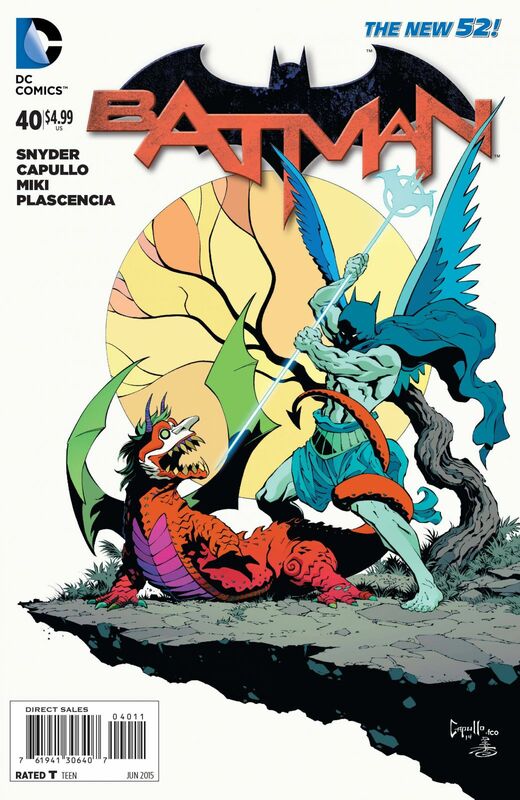 Batman Inc.’s conclusion had Robin (Damian Wayne) die in a fight with his Mother, Taila Al Ghul’s henchman, a more genetically modified clone of Damian. After the death of Bruce Wayne’s only son, he set off to go find a way to bring him back to life. During these tales, Batgirl and Nightwing half-way hashed out their troubles with Batman, Catwoman and Red Hood showed up to help support Batman, and a lot of the Death of the Family scars where closed, but not healed. Eventually, Batman finds a way to bring back Damian to life. Forever Evil saw an evil version of the Justice League appear in this dimension and start reeking havoc around the globe. While the Justice League is in hiding after recovering from the events of the Trinity War, Lex Luthor creates a team of villians united to stop the new evil Justice League. This team, while saving the world, is still evil in nature. In the conflict, Nightwing ends up dying; however, he is secretly resurrected in the aftermath of the event. Nightwing, is now recruited by the government to help as a secret weapon and is now Agent: Grayson. 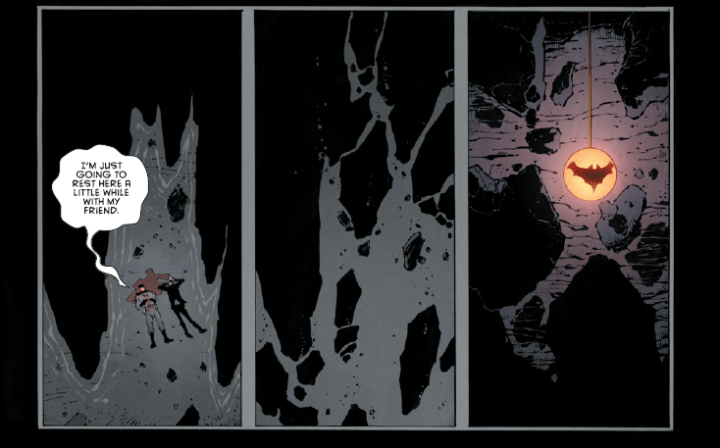 With all of the emotional fallout from Death of the Family, Damian’s Death, and Nightwing’s Death, the core Batman comic took a break, looked into the past and set up a new origin story for Batman, the Zero Year story arch. This new origin story started with a young Bruce Wayne returning to Gotham after his travels around the globe and told of his first adventures as Batman, overwriting the classic Batman: Year One. With Batman going on some present day adventures and everything feeling better, one day he is attacked by the members of the Justice League. The Justice League has been poisoned by a strong version of The Joker Toxin and they are out to kill Batman. Batman does not defeat them but he does manage to render them unconscious or weak enough to get them to ARGUS for anti-toxin treatment. Batman sets out to look for The Joker’s next attack while the Justice League are now rendered incapable for the time being . Over the past year, a new orderly started working at Arkham Asylum, named Eric Border. Eric Border specializes in research regarding The Joker and befriends Batman through his work. Batman, still looking for The Joker’s trail, makes his way to Arkham. While searching in The Joker’s old cell, Eric Border shows up and locks Batman into the cell. Eric Border reveals himself to actually being The Joker. Using makeup to hide his skin and muscle relaxing pills to hide his smile, The Joker hid right along side Batman, unknowingly, for a year. With his new face revealed, The Joker paralyzes Batman by filling the cell with gas and explains to Batman his plan. The Joker states that the Death of the Family attack was just fun and games, “meant to have a happy ending.” Since Batman ruined that fun, The Joker is now set on not having fun and actually destroying people and their lives. Once Batman recovers from the gas in the Batcave, it is revealed that The Joker created a new virus and has already infected the city. By having the virus be airborne, people of transmitted it quickly through out Gotham city. With no known antidote and unable to create one, Batman leaves to find patient zero, hoping to create an antidote. On the trip around the city, Batman finds that the virus also turns love into hate. With Batman being a loved hero in the city, a mob forms to chase him down once he is seen. Commissioner Gordon has been recruited by Batman to help research the new virus. In looking through old documents, Gordon finds a picture of an old, 1910, unexplained children’s hospital fire. In that picture The Joker is seen in the background. Frantically Gordon looks up old Gotham tragedies and old family photos, where he finds The Joker in the background of every picture. The Joker kidnaps Gordon and waits for Batman. Batman finds his way to patient zero, Joe Chill, the man that killed his parents. Upon entering the hospital ward for Joe Chill, The Joker has staged a reenactment of the shooting of Batman’s parents by using Duke Thomas (a character from Zero Year) and his parents behind a glass window. With Joe Chill reluctantly forced to shoot Duke Thomas’s parents, Batman flies past the glass and takes a bullet to his armored chest to save Duke’s parents; however, having done so has let the virus escape the room and infect Duke’s parents. The Joker had appeared along side Gordon for the show; however, in the ruckus caused by Batman, Gordon has broken free and aims a gun at The Joker. Gordon shoots The Joker square in the chest, seeming to killing him. Batman has taken Duke out of the infected hospital ward and gets a call from Gordon. At first Gordon is grief stricken by shooting The Joker, but on the phone Batman hears a ruckus going on. Once it is calm on the phone, The Joker answers to Batman, having not died from the bullet, and reveals that he knows all of Bruce Wayne’s past. Having saved Duke, Batman returns to save Gordon who now has an axe in his chest from The Joker. Gordon is alive but he is infected by the virus. Batman learns that the virus causes cellular degeneration and his deadly as well. During this time, Batman has enlisted Agent: Grayson/ Former-Nightwing’s help in analyzing The Joker’s blood. Nightwing calls Batman to inform him that the blood sample contains chemicals similar to the Lazarus Pit, revealing that The Joker is immortal. Now believing that The Joker is an immortal man and the virus set to kill everyone in less that 24 hours, Batman seeks out the Court of Owls for their knowledge. Meanwhile, The Joker has broken into the Batcave attempting to retrieve the Red Hood. Alfred defends the cave by shooting The Joker with a shotgun but not being able to kill him. In the fight, The Joker manages to cut off Alfred’s hand, but Alfred is then saved by Julia Pennyworth. Through a video broadcast, The Joker has started a parade through Gotham, showing off all of the items from the Batcave. While in hiding, Batman enlist the Batfamily to help with his plan: Batman will fake his death and secretly fight The Joker. Now we come to the events that have been revealed today. Batman’s fake death has allowed him to recruit his enemies as allies to fight The Joker. Batman forms a team with Bane, Poison Ivy, Mister Freeze, and Clayface, and they all go after The Joker. At one point, Batman ventures alone to find the origin of Joker’s regenerating element, Dionesium, which is also the key to the antidote. Eventually Batman finds the pool of Dionesium and is meet by The Joker. The two talk and fight it out in terrific fashion. The fight ends with both of them near death when The Joker explodes the cave attempting to trap both Batman and himself in the rubble. The Joker has succeeded in his attempt, the cave collapses, killing Batman and The Joker side-by-side one another. The Joker died next to his “best friend” and Batman died knowing his city was saved from The Joker. With Convergence in full effect, Bruce Wayne may not stay dead for long; however, for the moment, Bruce Wayne has died next to The Joker.